Happy New Years Eve! 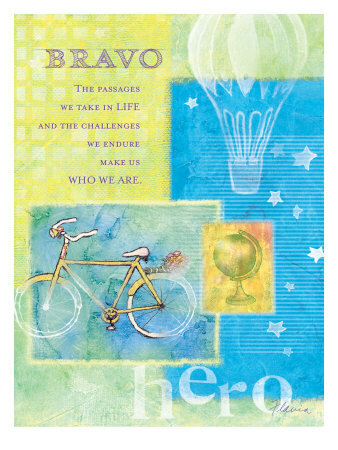 I would like to wish you the best for the 2012 year! 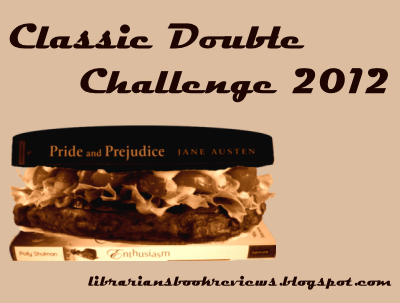 With the New Year, comes a new book list, and some challenges. This is my first year I'm doing challenges. I'm not making any promises though. School can always be a challenge, along with my sports, and personal life! But hey!, I'll give it a shot. 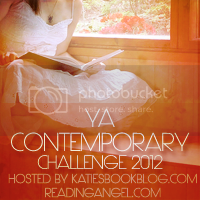 The Standalone Challenge is to read 15 standalone YA books in 2012! The idea of this is to challenge yourself. I choose level one.. I know a little easy which is to read 5+ books. I'd listed several books I wanted to read over my 16 days off, 18 to be exact. 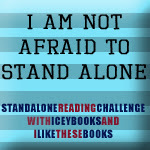 I'm six days into the challenge and I've only finished 4 books! What's slowing me down? Two re-discovered loves; Twitter and Puzzles. I picked up a puzzle of my favorite picture - Sunday Afternoon on La Grande Jatte - and have been spending hours on it. I haven't done this in a very long time and it has been so relaxing!! I hope to find slightly smaller puzzles though, this one is 1000 pieces. I've always been a fan of Twitter but I'd pulled back to read more - putting in a word here, a retweet there, but not really interacting. Since most of my tweeps are educators, we are all on break right now and the conversations have been awesome. So, less reading time but a touch more connection with self and others. So, what have I finished? Shelter by Harlan Coben - one of the LA teachers does a mystery unit each year, so I'm always on the lookout for new books for her to add to her repetoire. I haven't read any of Coben's adult books but this young adult one sounded intriguing and maybe it could be a gateway for some students. Although Shelter started out well, despite having the stereotypical sidekicks - a nerd adn a fat girl - it had promise. Coben did tend to tell too much, I never had to figure out anything, each question would be answered about 2 sentences later. And then the ending was so far-fetched as to be impossible. The age of the alleged villian would make the antics impossible. My disbelief came crashing to the forefront and wiped away most of my good feelings about the book. The good news is there can still be a good discussion about this one. Pair it with Virals by Kathy Reichs and then talk about craft and writing for a variety of audiences. Until There Was You by Kristan Higgins - I had been looking forward to this one, as I enjoy sappy romance. While there were enjoyable moments, they got sidetracked by the author's frequent exclamation of "bieber" or "elvis presley". I mean efron, lautner, gosling - yeah, I can see that working once or twice, jk. Throw in how often she told us Liam was hot (in a stereotypical bad boy in leather jacket with motorcyle way) and I was just happy to finish. Shatter Me by Tahereh Mafi - I had really been looking forward to this book! I like science fiction and this has girl protag! It started out slow and ended on predictable. But, the middle was fantastic. I just don't understand why she didn't use her undisclosed till later powers more. Also, she never wore that awesome dress on the cover! Pair this one with Legend by Marie Lu and you are destined for a great conversation. Darth Paper Strikes Back by Tom Angleberger - This follow-up to Origami Yoda focuses on Dwight and whether Yoda is helpful or hurtful. Dwight's nemesis, Harvey, makes a Darth Paper puppet and uses it to taunt this students, trying to convince them that Yoda is fake. The problems brought to Yoda this year seem much more serious. I like that turn. Obviously, pair this one with Origami Yoda and some actual origami. Ok, back to reading! How are you doing on your reading goals? It's that time of year. Challenge time. How will I grow as reader and a reviewer? Each year, I attempt something new and usually abandon it about 1/4 of the way through. Not.This.Year. I am going to do this. I have two official sign-up challenges and then some personal challenges I will be tackling this year. I enjoy reading Fantasy and Science Fiction. I'm not sure what attracts me to these titles and I want to find out. This particular challenge will pair nicely with my own personal Cybils challenge listed below. 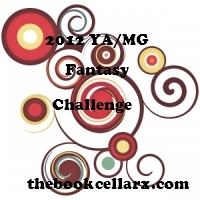 For the YA/MG Fantasy challenge, you need to read 10 YA/MG Fantasy books released in 2012. This challenge definitely needs a shorter name! There were too many books on the Cybils F/SF nominations list that I had NOT read. So, I am going to remedy that by trying to read 15 books off the YA list and 15 books off the MG list. Some of these will be decided when they release the finalist list on January 1! I became interested in the ALA Printz award back in 2006 when I became a middle school librarian. I've been into it pretty much nonstop. In 2010 I formed the Goodreads Mock Printz group. This started as a part of a book group I was hosting at work and has grown from there. I've been trying to at least read the winners of the award but decided this year to challenge myself to read all the Printz Award/Honor books for the past 11 years. Donalyn Miller, The Book Whisperer, has a book requirement in her classes. She challenges the students to read 40 books in a variety of genres, to stretch themselves, to become better readers. I take up her challenge with #bookaday and want to participate in this one too. Although her exact numbers to read in each genre may change with her students, I'm going with the original one published in The Book Whisperer. I also want to read a variety of adult books so, I'm adding a component for genre books written for adults. Hence, the "A" in the challenge title. Every year School Library Journal hosts a Battle of the Kids' Books to find the best book of the previous year. 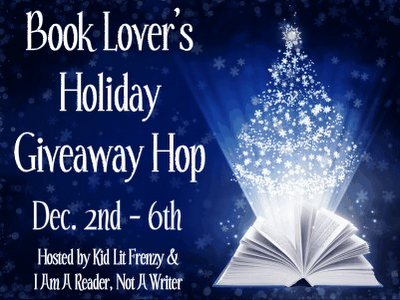 They get celebrity judges, authors all, to read two of 16 books and determine which will move on until only 1 is left. I discovered the challenge in 2010 and read 11 of the 16 books. Last year I read 15. My goal for 2012 is to read all 16 and try to pick the winner! 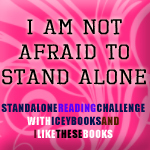 I'm creating a challenge page that will list a combination of books I want to read or have read for challenge. Are you up to the challenge? 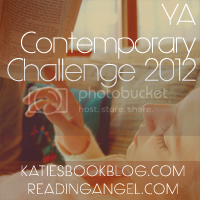 What are your reading goals for 2012? UPDATE: Adding a Newbery Awards challenge that will cover three to four years! Check out Watch.Connect.Read for details! Totally "stress-free" #nerdbery challenge! Yay, Mr. Schu and Mr. Sharp! This is my second year joining Donalyn Miller, The Book Whisperer, in holiday #bookaday. We challenge ourselves to read a book each day we are not at work. I have 16 days off and many books to tackle for Mock Newbery and Mock Printz plus I have two books to read from The Nerdies and two recommendations. Hmm..
That's good place to start, but there's more than 16 books and some of them are long! I better get cracking! Do you have any days off coming up? If so, what are your holiday reading plans? Also, here are the top 10 books I'm anxiously awaiting for in 2012! Ninja Chica Lucy has a good mix of old and new titles she's looking forward to and you can see, she's keeping it real! The Personal History of Rachel Dupree opens with Liz, Rachel Dupree's six year old daughter, sitting on a plank that's being lowered into a well. Liz isn't being drowned, she's going down to get water for the family because the drought has left them with no other options. Or so Isaac Dupree has convinced his wife Rachel there are no options. They've been married a long time and Rachel is starting to lose faith in Isaac. She's seen him put their land ahead of the welfare of the family too many times. He will do ANYTHING for the land. Not so much for his family. Rachel and Isaac have been married a long time. They met when Rachel was a cook in Isaac's mother's boardinghouse. He came home after the war and she fell in love. Isaac fell in love too, but not with Rachel. More with the land she could give him. He was determined to go west and make his fortune as a landowner and he was entitled to 160 acres. He didn't want to marry Rachel but he could see how she felt about him. And he did want her 160 acres - immediate land doubling. So, they got married and both Rachel and Isaac thought they got what they wanted. They were both wrong. Ann Weisgarber tells the Personal History of Rachel Dupree in alternating time periods but always through Rachel's eyes. While Rachel's story of love making you blind is compelling, I find the setting is an even stronger character: the drought so strong they could only take sips of water, the lightning storm that promised survival on one hand but didn't quite make it, the landscape so harsh that all the neighbors were leaving them. Rachel uses the weather as sort of a touchstone, it brings backs memories of other, mostly happy times. These times serve to give Rachel the strength to make some tough decisions. Or at least to plan them. I'm hoping that if I'm in the situation that Rachel is, where my husband continually proves that he doesn't actually love me but really loves the land, where my husband continually puts my children and me in danger, when my family is about out of food and my husband will not ask his mother for money, where there is never enough money, ever. I hope that I don't wait over 14 years to get strong. I hope that I'll pay attention to the signs that he gives me along the way. That the ache I get from his disapproval - and my kids too - serve as a warning. Even sort of knowing what's going to happen doesn't prevent The Personal History of Rachel Dupree from pulling you in. The vivid scenery descriptions place this book solidly in the 1900s. The tumbleweeds, the shack, the clothing - this is good historical fiction. 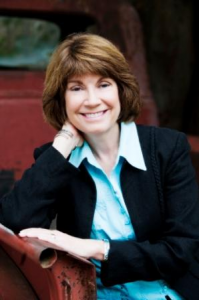 Ann Weisgarber was born and raised in Kettering, Ohio. She was a social worker before earning a master’s degree in sociology at the University of Houston and becoming a teacher. She divides her time between Sugar Land and Galveston, Texas. 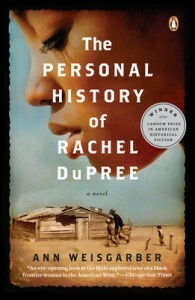 The Personal History of Rachel Dupree has been optioned for a film my Viola Davis who played Abilene in The Help. Thanks to Penguin Books and TLC Book tours for the book! The Next Door Boys By Jolene B. Perry GIVEAWAY! At times Leigh gets weak, and is having problems staying awake. She doesn't worry about it much as she doesn't want to be an outsider. When I started reading the book, I didn't realize that religion was a big part of the book. Once doing some research I learned why the temple was a big part of the book. I'm glad I stuck with it, as I couldn't put it down!!! I was able to connect with the characters which is a big thing for me. I am very good at forgetting characters, but with this I didn't! I kept thinking of them after I finished the book. I keep making predictions on what happens in the next book! I would like to thank Net Galley, and Cedarfort for letting me have the opportunity to read this book. The giveaway is open to North America and International. If you are an International winner you can ONLY receive an ebook. If you live in North America you have the option of a hard copy or an ebook. Leave ONE comment telling me your most unexpected read, and why. Please welcome the Ninja Chicas! Here they are talking about Books Students Like to Read. Check out their linked pages for more information about them and the books they like to read. Review Policy here. Aneeqah's Not So Real Life - I think it depends on where you are. Where I am, kids seem to be interested mainly in realistic fiction. I think it helps them connect their experiences with something. Isabella and Anusha of Bellanush - Isabella says: I think action for guys because its almost always about fighting,blood and death. I think girls also like action but do enjoy a good romance book because everyone loves when the gorgeous guy comes and helps the girl and how they will always be together. But I think most girls like when it doesn't end well and they have to work it out. Alexa of Simon Cowell's Corner - I believe that books that kids my age really like to read are romance novels, (though I really don't enjoy them) All kids, mostly girls, at the pree-teen age like to imagine if they had a boyfriend like the wonderful, non-realistic ones they experience in novels. The Sisters - We would both have to say fantasy, mystery, Sarah Dessen (for girls), adventure, fantasy romance (once again girls, I have never seen a boy even look at twilight), sports books (for boys) and last but not least adventure. The Ninja Chicas are looking for books to review. 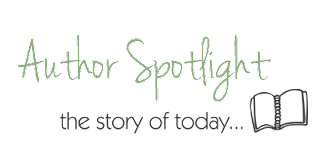 Check out their posts by clicking the links and find out the types of books they would be interested in reading/reviewing. Check out The Brain Lair for our review policies. I'm gonna try to catch up on some reading from our Mock Printz Goodreads group! Happy Reading! &amp;amp;lt;br/&amp;amp;gt;Share &amp;amp;lt;a href="http://www.goodreads.com"&amp;amp;gt;book reviews&amp;amp;lt;/a&amp;amp;gt; and ratings with Mock Printz 2012, and even join a &amp;amp;lt;a href="http://www.goodreads.com/group/"&amp;amp;gt;book club&amp;amp;lt;/a&amp;amp;gt; on Goodreads. Morris, Gerald. The Adventures of Sir Gawain The True. Houghton Mifflin. 2011. 14.99. 9780547418551. Oh, Gerald Morris. You had me at "You don't think that just because you saved my life we're, you know, in love or something, do you?" Sir Gawain the Undefeated was just that and while he didn't lack courage, King Arthur also wanted his knights to learn how to be kind and courteous. Shortly after Gawain's less than stellar encounter with a lady and a dragon, (but no tattoo) King Arthur reminds his nephew, and the other knights, that chivalry is NOT dead! Sir Gawain is having none of it, I mean, he doesn't want to be called Sir Gawain the Love Doctor now does he? But, alas, we follow Sir Gawain and watch as he moves from a steadfast belief that "might makes right" to thinking carefully not only about situations but about the people involved in them. If you don't know anything about King Arthur, no worries, Morris takes the legend and brings it to an understandable and easy-to-grasp level. This would be perfect in a classroom. It's only 118 pgs and includes adventure, friendship, battles, and trickery all covered in a healthy dose of humor. I can see it as a read aloud. I'll be picking up the other two books in the The Knights Tales and you should too! Review: This story is about a girl named Karou, who lives in a town called Prague, in the Czech Republic. She's a little unusual. She has blue hair, draws incredible well, plus other strange details, but the strangest thing being: she lives a double life. All of her life, she's been divided by her two lives, her normal one, and her not-so-normal one. And all of this time, she's always felt a little... off. But how could she not, working for a magical teeth-collecter? I think I surprised myself in two ways while reading this book. Let's start with the good one. Even though there's lots of unfamiliar words and names in this book, I could remember them and keep them seperate without any problem. Usually, with lots of confusing names, I have to flip back in the book and try to figure out which person is which, what word means what, or I just keep reading and hope it makes sense to me. But I never found myself doing that in this book. Ms. Taylor made very distinct names and characters, and so it was very easy to keep up with everything. The other thing I surprised myself with was that I easily guessed the whole mystery of the book. The whole question, the suspense, once I met the other important charcter, I guessed it with a snap. I'm not sure if it was supposed to be that obvious, because I'm absolutely terrible with figuring out the mystery. Seriously. Something could be so obvious, and I would totally miss it. But that wasn't the case in this book. Which very much surprised me. One thing I also loved about this book is the description. I've read some very descriptive books before, and to be honest, I just skimmed through alot of those books. But the descriptions were so unique in this book, and it painted a picture of the whole scene to me. I think it defiantly added a whole lot to this book, and it made it better. Also, I think Mrs. Taylor added lots of details in the magic aspect of the book. I don't want to give anything away, but I feel as everything is very well-thought out, and I don't even think I have any questions about how it all works, and trust me, I always have questions! The things I didn't like about the book? The main problem for me would probably be that it dragged in places. I know the author had to set up the scene and everything, but for me, that took too long, and honestly, it got kinda boring in the beginning of the book. It took a while for me to actually begin to get really intrested, and even then, the book sometimes lost my intrest near the end. The middle was for sure the most intresting part for me, where there was some really good conflict and some action. Another thing I strongly disliked was the fabulous cliffhanger. Honestly, I shouldn't have expected more from this book. I don't think I've read a book that came out this year that doesn't have a cliffhanger. It would have been nice if this book would have been different, but of course, it didn't. Cliffhangers are really starting to get on my nerves. But, hey, that's the price you pay for reading good books, right? In the end, I think this book is great for more older readers. Younger kids won't really enjoy it, since it doesn't have much action in it. Honestly, I was expecting more action than what I got, which isn't necessarily a bad thing. But it was still a pretty good read. I'll be looking forward to the next one! Hound Dog True. Urban, Linda. Harcourt Children's Books. 149p. 15.99. 9780547558691. This is the story of Mattie Breen. A shy, ten-year-old girl who's always moving and just wants to be a "custodial apprentice". Hound dog true. Mattie figures if she works with her uncle, Potluck, during recess adn other school-related free time, she can avoid the debilitating effects of being new and friendless and having no one to sit next to or chat with. Then Mattie meets Quincy. Quincy has this unaffected way of talking, like everything and everyone is boring. You know the tone. It's how the word "whatever" became so ubiquitous. Anyways (ha! ), to Mattie, Quincy is like this sophisticated teen and she's afraid that she'll be rejected by her so she's determined to avoid her and spare herself the heartache. Unfortunately, her mother has other ideas. So Mattie decides she can be cool and unconcerned. But you can only pretend for so long. I was a Mattie. Still am. I prefer books to people because I always feel out of my league. Like, why are these sophisticated people talking to me. Or, more often than not, why aren't these sophisticated people talking to me! How can I be more like them? How did they become so awesome? Is there some secret school these people went to that I need to know about? Luckily, since I read a lot, I know all about characters and I routinely try different ones on hoping no one notices and they accept this new "me". It leaves me on edge, always second guessing myself, checking my words before spitting them out. It's why I love texting and twitter. I can be anybody! Hound dog true. But, enough about me, please! Linda Urban has a passion for what she calls "quiet books", as evidenced by both Hound Dog True and A Crooked Kind of Perfect . This is one of those quiet books that, on the surface, seems like not much is happening, but underneath, you can see the changes in Mattie, the struggles she's facing and attempting to overcome, and you root for her and you pray and you hope and you keep reading because if Mattie can do it, so can you. For you writers out there, check out Urban's earlier attempts at Hound Dog True. It gives you hope. Don't give up because you didn't wake up with a vision and the story pretty much writes itself. Sometimes the good stuff takes patience and perseverance. Poor Moe. The Flint Heart by Katherine Paterson - Eligible? The Flint Heart. Paterson, Katherine and John. Candlewick Press, 2011. 19.99. 9780763647124. This "freely abridged" version of Eden Phillpott's The Flint Heart written in 1910. It says abridged - Phillpott's story was 334 pg and Paterson's is 288, but it appears to be the same story. I wonder if it's eligible for the Newbery? According to the Expanded Rules of the Newbery Manual, a book should be an original work. Something New. It can have parts pubbed before. But, each committee has to determine what that means to them. I think this one is NOT eligible but would love to hear your thoughts. I did find something in the comments on The Heavy Medal blog when they discussed The Girl Who Circumnavigated Fairyland in a Ship Of Her Own Making. But, as mentioned, rules depend on committee. If you were on the committee, what would you say? I loved this book! I just enjoyed everything about it! It was an interesting idea. The two different colored eyes, Katsa's graceling being survival not killing, Po losing his sight! I was absolutely mesmerized by this book. :) Yes, Po losing his sight did make me sad, but it also seemed needed. So I definitely enjoyed this book and I hope others do to. I think this is a good book for people who like descriptive writing and read a lot. But I also think people who don't read a lot would enjoy it because it has a wonderful plot. I didn't like this book. No, actually I hated this book! I found it boring, annoying, dumb, insufferable, and most of all, stupid. First off, I HATED the main character! I found her really annoying, because in the beginning of the book, Katsa seems very strong and unbreakable. Then in the middle, she was breaking down and crying over every little thing! Near the end, she was just a mess. Crying one second, taking down an army the next. In love one moment, furious the next. I hated her little mood swings! They were really annoying. The author could have made her a great character, but all we got was this ignorant, annoying, stupidly emotional, mess. It's pretty sad actually.... Second reason why I hated this book was the story. The idea of Gracelings didn't appeal to me from the start, but I thought it would get better. I thought the author would make them more interesting, but no. That never happened. The Gracelings could have been great for the story, but the author chose to focus on everything BUT them. I also hated the whole medieval theme. The characters speech pattern got really annoying after a while, and I just couldn't stand it! It didn't seem perfectly medieval,or at all normal. The speech was at an annoying level in between! Overall, I felt like the book was a COMPLETE waste of my time.